keeping him from his clarinet. 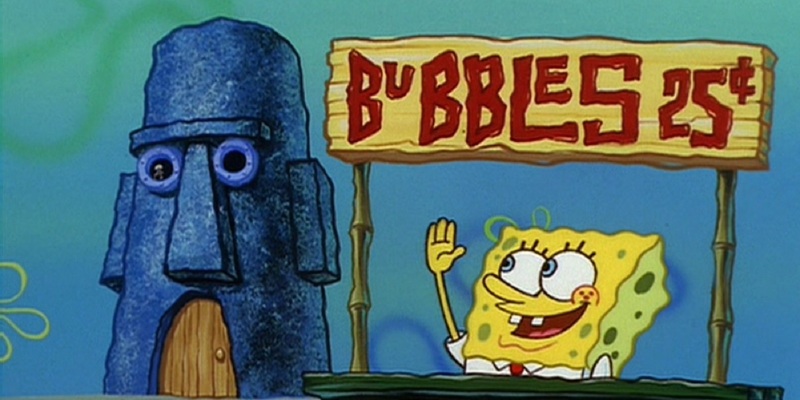 But like SpongeBob says, "We're not just making bubbles, we're making bubble art!" Squidward, unimpressed and arrogant, tries to prove that there's nothing challenging or unique about blowing a bubble, only to fail at creating a successful one himself. After frustratingly trying SpongeBob's "technique," he manages to yell a large bubble into existence. Crediting his "genes" and not the "technique," Squid walks away more arrogant than before, and while he celebrates in his home, the giant bubble comes back to lift his home into the air, blow up, and send his house crashing to the ground. Pathetic and broken clarinet sounds end the episode on an ironic but amusing note, serving as one of the earliest demonstrations that Squid's arrogance doesn't win out over SpongeBob's earnestness.